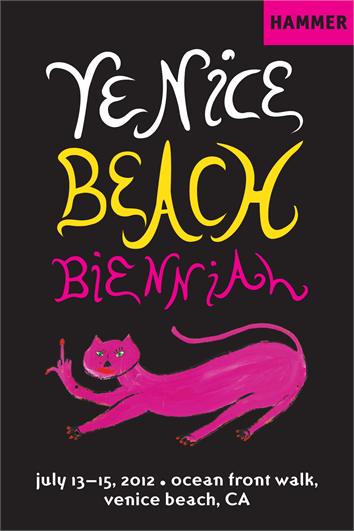 Venice Beach Biennial, July 13- 15: This weekend art hits the sand at the first and only Venice Beach Biennial. Artists from all over Los Angeles will exhibit and sell their work alongside veteran Venice Beach boardwalk vendors in this unconventional arts venue. Judging from this poster image, parents may want to use some discretion. KCRW DJ Night at the Hammer, Thursday, July 12, 7:00-10:00 pm. Live DJ sets in the courtyard by the great Anne Litt, and late night gallery hours for the exhibition Made in LA. Cash bar, prizes, and free museum admission. Into the Night at the Skirball Center, Friday, July 13, 9:00 pm-1:00 am. This year’s cool late night party features indie folk stars Sea Wolf (love them!) and Geographer plus games, art activities, screenings, and cash bar cocktails (tickets $15/$20). Ages 21 and up. Frame Your Masterpiece Family Art Night at the Norton Simon, Friday, July 13, 6:30-7:30pm. Tour the galleries and discover the museum’s fabulous art frames, then create an original cardboard frame. Ages 5-10 yrs. Make Your Own Games workshop at CAFAM, Sat July 14, drop-in between 1:30-3:30pm. Explore antique parlor and arcade games in the exhibition Baseball: The All-American Game and invent and build your own game. All ages. Fee $5, free to members. Fabulous Festivities at the Getty Center. Saturday and Sunday (thru July 22), drop-in between 11:00am-3:00pm. Program includes a family gallery visit and activity workshop. Ages 5+. Free, no reservations.